A good turn out of 10 members at last week’s meeting – but missing the Cha(I)rman who is camping in Mayday Hospital (hopefully out now) with gall stones. They say they are just observing him – it’s a tough job but someone’s got to do it….. The usual variety of stock was on display…. And some evidence of things happening to my N-club modules…..
Ballasting has started on the second, small board, together with some scenery in place. The buildings are in place, but not fixed. I’m not sure whether the water tower belongs there, but its a fine structure, and I wanted to put it somewhere on the layout. All the buildings for the main board, except for a second signal tower. I was very pleased with these Blair Line loading platforms – very fiddly, but they’ve come out rather well. There will be an end loading ramp, plus side loading. I saw these used on another layout blog and they seemed an interesting (and quicker) alternative to another line of sheds. It should be presentable by the time we go to Stuttgart – about 5 weeks to go…. 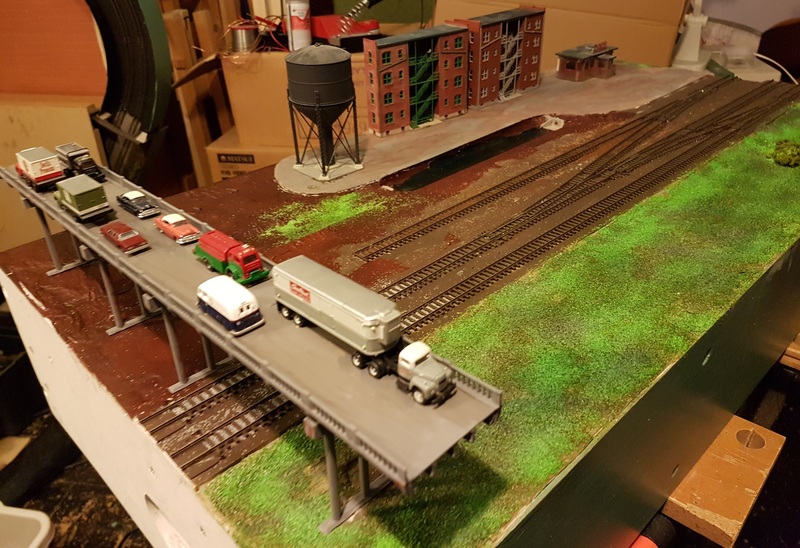 This entry was posted in ESNG, ESNG meetings, Jon's layout ramblings, On my workbench and tagged ESNG, ESNG Meetings, modular layouts, N-Club International. Bookmark the permalink.